Rouge the Bat is an eighteen-year-old antropomorphic white bat, and one of the main characters from the Sonic the Hedgehog series. She carries a lot of experience in treasure hunting, mainly focusing on the Master and Chaos Emeralds. Along with this, she also serves as a part-time government agent working with the Guardian Units of Nations (or G.U.N.). She first debuted in Sonic Adventure 2 and has been showing up regularly in the series ever since. Rouge has the ability to fly with her bat wings. In the Sonic series, Rouge plays a somewhat big role. She is a crook who is fond of stealing the Chaos Emeralds along with Shadow the Hedgehog. She occasionally will help out Sonic, and has been shown to have a romantic interest with Knuckles the Echidna. 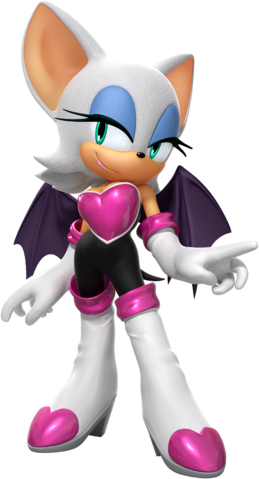 Created by Sonic Team USA, Rouge's original name was going to be Nails the Bat, but was changed to match her personality better. Created along with "Shadow the Hedgehog", Rouge has made a lasting mark on the series. Rouge makes a minor cameo in Super Smash Bros. Brawl. Rouge's Sticker, which depicts her appearance profile picture, adds ten points to tail attacks and is usable by Yoshi, Pikachu, Diddy Kong, and Pokemon Trainer. In Super Smash Bros. Ultimate, Rouge appears as a Spirit. Rouge makes an appearance as a boss in the Festival mode of the Figure Skating event in the Wii version. In single player mode, Rouge appears after the player trains in Figure Skating and challenges them with a high score to beat. In Co-op Festival mode, Rouge appears right before the halfway point of the festival with the same challenge. It is said by Toad and Cream that her performance is amazing and without a single mistake. Rouge also appears as a Mii costume in the shop for 300 star points, increasing the player's Skill points greatly. In the DS version, Rouge is first seen in the area past the mechanical gate that Tails is required to fix in Frostown. When approached, Rouge is in deep thought as to the whereabouts of Shadow, and does not seem concerned with the stolen Olympic memorabilia. Later on in Cubyrinth, Shadow mentions seeing a flying treasure hunter and accepts to join the team in case any troubles might arise with the hunter (who is really Rouge). Mario and Sonic make a deal with Rouge to exchange Whitestones with her for Olympic memorabilia; each piece is worth three whitestones. Shadow the Hedgehog, or anyone else who the player chooses, faces off against her when Bowser and Dr. Eggman bribe her with a ton of Whitestones to defeat the player in Figure Skating, tricking her. She accepts, unaware that it's a trick, but when defeated, she aids the player and helps free Blizza. While this is happening, Eggman and Bowser capture Frosty, but Rouge quickly pursues them. When talked to afterward in Frostown, Cubyrinth, or Sparkleton if the player is at that point already, Rouge apologizes for letting her greed get the better of her and mentions how Bowser and Eggman gave her the slip. From then on, Rouge continues the Whitestones dealings and continues from town to town searching for memorabilia. She's later seen in the credits of the Adventure Tours after Bowser and Dr. Eggman are defeated again in a picture with the other villains: Bowser, Dr. Eggman, Bowser Jr., Metal Sonic, Eggman Nega, King Boo, Boo, Dry Bones, Big Bullet Bill, Omega and Jet the Hawk. Dry Bowser is the only villain absent from the picture. In the Wii version, Rouge is a non-playable character. She is one of various characters that the players can speak to in the London Party Mode and appears as a rival in the 110m Hurdles event. If the player defeats her they can receive a sticker. In the 3DS version, Princess Peach challenges Rouge in the 100m Backstroke event. After defeating Rouge, she reveals the the fog hypnotized her and agrees to help Peach, Daisy, Amy, Blaze, Blue Toad, Purple Toad, and Yellow Toad. Once they find the fog machine, Blaze destroys the machine and Toad, Mario, and Luigi find the girls to check if they're okay. Rouge appears as a boss in the Legends Showdown mode of Mario & Sonic at the Sochi 2014 Olympic Winter Games. As all of the playable characters are about to claim the Legend Trophy, she ambushes them along with Eggman Nega and Dry Bowser. The player must then face all three of them in the Winter Sports Champion Race event. Rouge appears yet again in Mario & Sonic at the Rio 2016 Olympic Games‎, this time, as a fully playable character. In the 3DS version she's exclusive to Golf, while in the Wii U version she's exclusive to Beach Volleyball. A treasure hunter with an eye for gems. Though bats are usually very mysterious, Rouge has no problem expressing her strong drive to get what she wants. She's foxy and clever, and even the infamous Dr. Eggman has been fooled by her on occasion. This page was last edited on February 9, 2019, at 19:53.